To start with, I have seen a bit of active scaffold stuff and was very impressed with it originally already. In the meantime, rails 2 have arrived. Quite a few things have changed and I was thinking that it might have an effect on the overall picture of active scaffold also. However, checking up on railsforum etc brought out that not much effect has gone down to active scaffold kind of plugins from rails 2.
try it here... www.activescaffold.com It turned out to be really simple to initialize yourself with it. Today I came across a few news items and articles here and there that talked about the release of OpenSolaris projects' May 2008 release. So, I have been able to install the server edition inside the vmware machine. I have never used nfs before, but the tutorial I was following was suggesting to use it. Trying to expand the virtual hard disk inside vmware. I tried it, but havent succeeded yet. The Oracle installer exits with a strange error message. For basic encryption purposes, base 64 encoding can be used. In fact its so basic that it would probably be incorrect to call it encryption. Its more encoding, basically preventing the subject text from appearing in plain text. For example, if in some tool, all the parameters are stored in repository tables, and therefore, its not very nice if the passwords are stored there in plain text. They should at least be made illegible, so that they dont appear in plain text and there is some effort spent in decoding it. Base64 encoding is an industry standard and almost all programming languages, development toolkits provide plugins for this. For Oracle, there are pre-existing packages providing the functionality. The idea is that, such sensitive data to be entered by customers, in encoded format. So, we also dont see the plain text version. And then the program uses the encoded version, right to the point before actual data needs to be used. 1. On Oracle side, the sensitive data is encoded using a program call equivalent to the following will return an encoded/decoded string for a given input string. Its a design decision whether to put this code in a procedure/package somewhere. I installed vmware 2 beta on my hardy. It was a surprise and a pleasant one at that, the installation procedure did not require any tweaks at all. It worked out of the box. Further, when I tried to connect to the web based management interface, I encountered my first problem. vmware requires a log-in with root user, and as any ubuntu user would tell you, the root user is well-hidden in ubuntu. Almost never used, my knowledge on how to set a password to root user was zero. Again, communities came to help. This thread on vmware communities helped me through that. Its a small tip, but none-the-less important. Just run "sudo gnome-terminal" and it would open a root terminal for you. Once there, type "passwd" to change the password for root user and you are done. now, in the browser, log in to vmware web mgmt interface with user as root, and password you chose for root user. As a precaution, I gave my normal user admin privileges so that I dont have to login as root all the time. Oracle's wrap utility helps to hide the application logic from being visible. However, I recently discovered that it doesnt hide string literals. String literals, number literals, and names of variables, tables, and columns remain in plain text within the wrapped file. Wrapping a procedure helps to hide the algorithm and prevent reverse-engineering, but it is not a way to hide passwords or table names that you want to be secret. On Ubuntu's latest release, Hardy Heron, if you are using xserver-xgl package for graphics, you are in for a surprise. The system monitor carries on a bug in xgl package wrt incorrect reporting of memory usage, and shows processes using zillion bytes of memory. 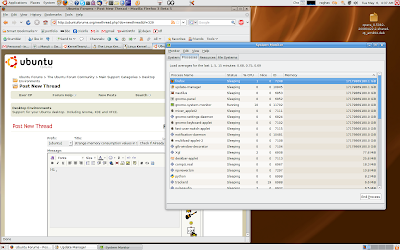 I started using xserver-xgl from the times in Gutsy when Compiz would not run on my hardware without that. However, I didnt quite notice this until I involved myself with beta release of hardy. Compiz should work without needing this package as well. I have been fascinated with the rendering of web pages by Safari. Always liked it, it has a certain edge to it when talking about the look and feel. When I read more, it turned out that the rendering engine is similar to Konqueror (somewhere I read that its actually based on open source libraries from Konqueror). I dont have a mac so I cant really experience it first hand, but the windows release of Safari made me get my first experience. This made me think, if its actually open source to start with, the code must be available and may be I can compile it for my system. The sample browser, gives me 98 on acid3 (acid3.acidtests.org). Though very minimalistic in capabilities, this is the best score for acid3 that I could get on my system. On my windows partition as well, none of the browsers went beyong 70's. Best being opera at 71. Found this interesting site. If you want to start knowing or playing around with linux kernel, this site could be a interesting start. For those who try to use vmware server on windows vista (unfortunately I am trying these days), the vmware server 2 beta is using tomcat engine to provide web based environment. The access control is weird to say the least. It doesnt matter if ur user has Administrtor rights on the vista box. You have to have the "Administrator" user and log in as that only. So, you got to make a new user called Administrator and then log in to Vmware Infrastructure Web access. I found the help on vmware forums. reproducing here for benefit of myself (lest I forget) and others who might come across. Logon to Vista using your usual account.